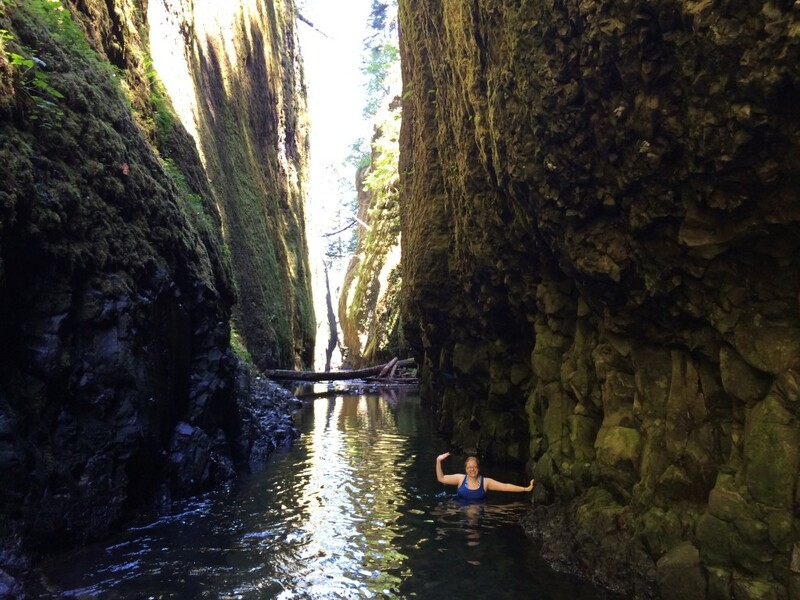 One of the items on my list to explore this year was Oneonta Gorge. I finally made it happened, and was so overwhelmed I’ve done it twice more in the last month. 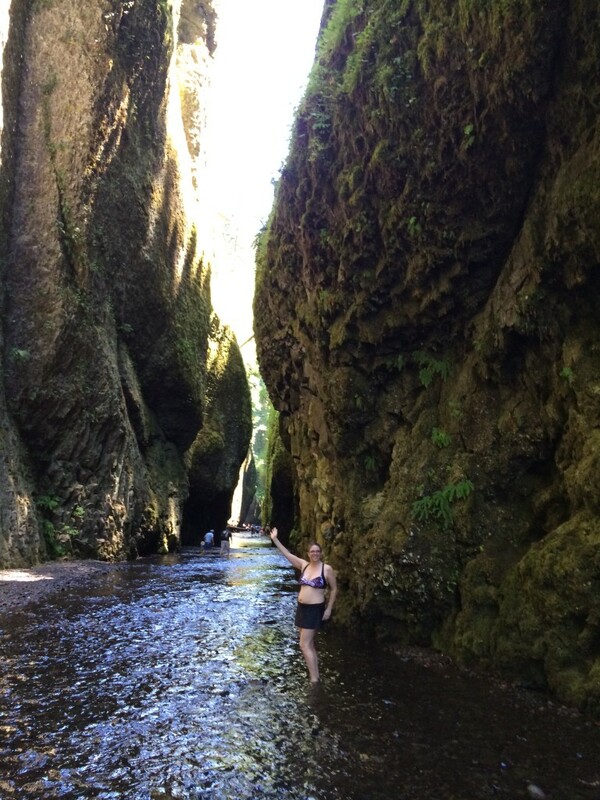 First let’s talk about gorges. 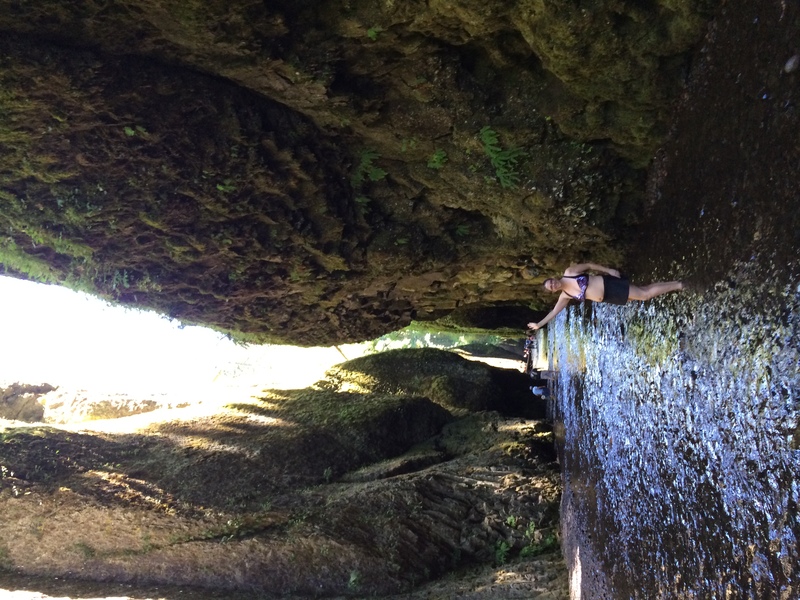 Most people in this area are well familiar with the Columbia River Gorge; it’s the river bed between two tall bluffs of stone, right along the border of Oregon and Washington state. And it’s big, massive, large enough for the Columbia River to flow through. When you leave the road and scramble down the hillside to the creekbed, there’s an immediate log jam to cross. It’s about 20-feet tall and maybe 60-feet long. Slippery rocks and wet, barkless logs make this a non-trivial passage. 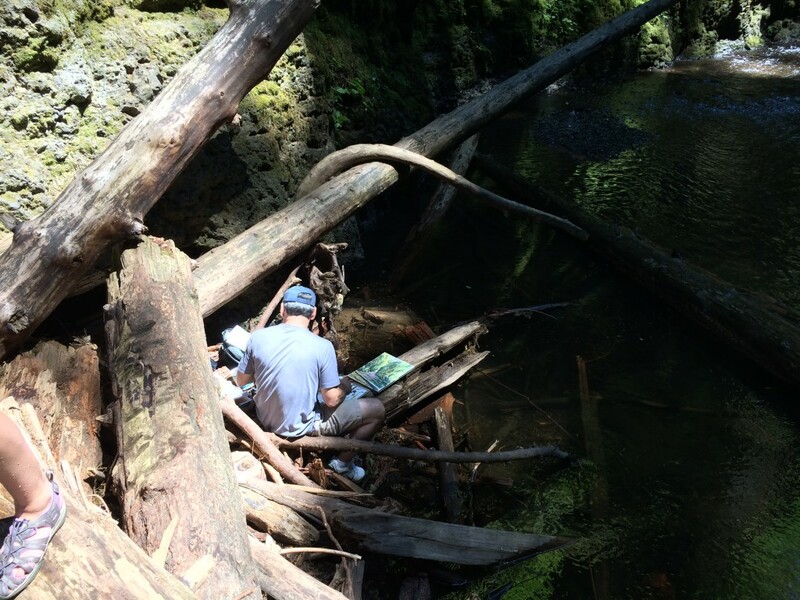 On the first time I did this hike, there was a fellow nestled in the logs, doing a watercolor painting of the scene. Once you’re past the logjam, the path flattens and there’s a pleasant wade through the deep, mossy ravine. As you get even farther back, there are a couple of places where the water gets deeper and you have to wade through fairly deep water, up to your chest. Hold your backpack high if you care to keep it dry! 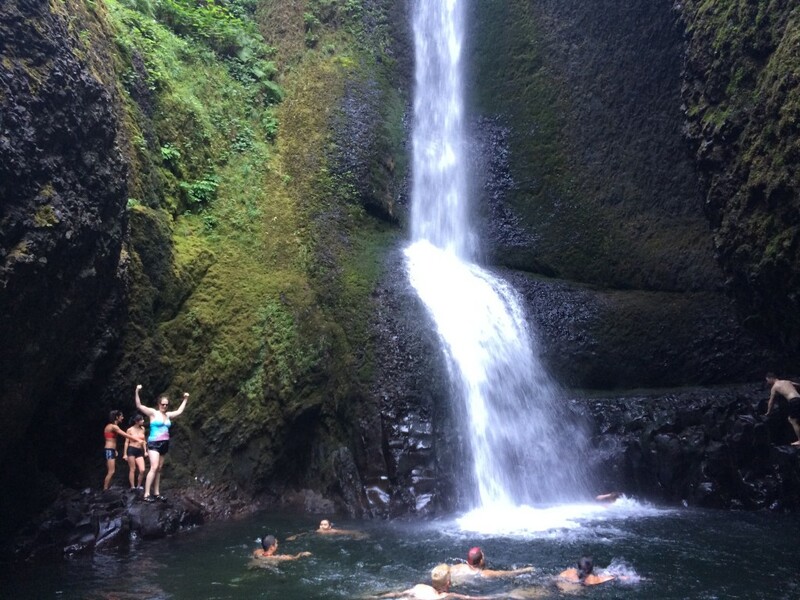 Once you’ve had your adventures in wading, the falls are in sight! The water from the falls is all snow melt, but wading through the creek isn’t too bad; the water runs through enough shallow creek bed and has a chance to warm up a bit. 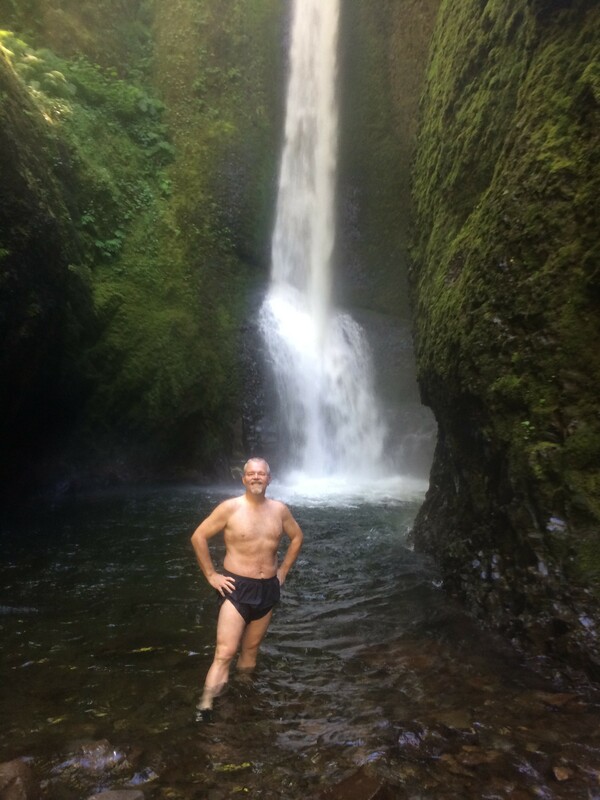 But the pool at the very back of the gorge, at the base of the falls, I swear it’s a good 10°F colder. Brrr! But it’s so amazing, so stunning that people can’t resist swimming in it. The bravest swim to the back and climb the rock wall to jump into the pool. And finally, here is your intrepid blog author, posing at the falls. If you’re local and it’s a hot day, I would love to introduce you to this sight; it has become one of my very favorites. AWESOME. Looks like jiiiist enough challenge to be a lot of fun without a lot of fuss. And wow, there were a buncha people there. I bet you know just the right times to have the place all to yourself. Loved this post. Now go find more awesome hikes and tell me all about them.